Went with James, Lori, and Thomas a couple weeks ago to a place they recommended and knew how to get to but couldn't remember the name of. 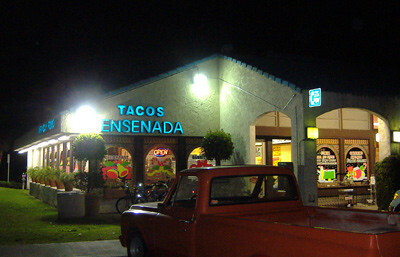 Described by James as "a hole-in-the-wall but a big hole-in-the-wall" it ended up being Tacos Ensenada in Lake Forest. 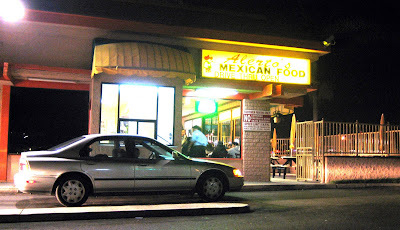 Better brush up on your restaurant Spanish before coming here since you won't see anything in English once you arrive and chances are the person taking your order won't know English. 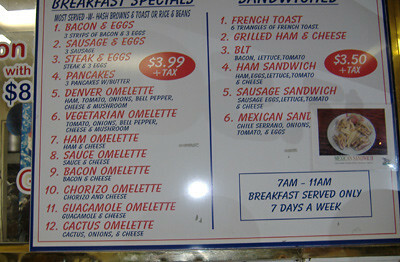 If you really don't know any Spanish though don't be scared off because many of the menu items are pictured on the wall (good for people like me who like to see what they are ordering before it arrives at the table). 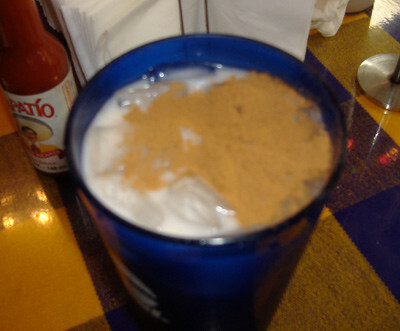 And, no, I didn't put Tapatio in my horchata. 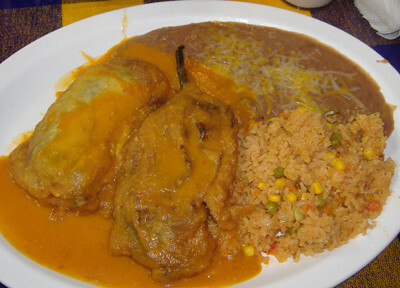 Lori ordered the chile rellenos platter which is really two chile rellenos and exclaimed how spicy hot they were. James, who has a higher tolerance for spiciness, then tried a bite and said it was almost too hot even for him. 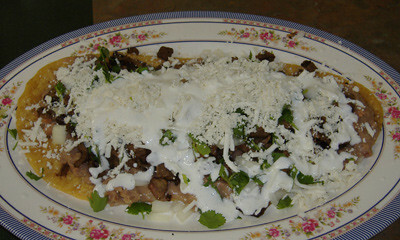 So, if you like really overtly spicy chile rellenos then this is the place to get them from. 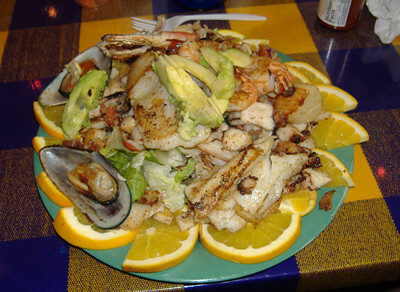 As mentioned above, I like to see pictures of dishes I'm thinking of ordering before I order them and when I saw the picture of this seafood platter on their wall I was sold. The taste matched the image with everything fresh, nothing too tough and chewy (as octopus can tend to be), and big enough to share. 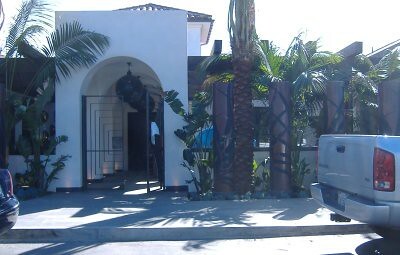 Here we have something like a double review, which is really a reprint (with permission) of ElmoMonster's review of Alerto's in Westminster, then my thoughts on the one in Fountain Valley. These locations are both on Brookhurst, perhaps two miles apart from each other so they should each be the same but apparently one is a good bit better than the other (as borne out by numerous comments in ElmoMonster's original post). Now as a postscript I have to admit that in the comments on his blog I mentioned not really liking the Fountain Valley location, or at least having had a bad experience there. 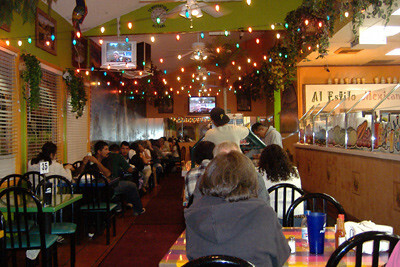 I'm willing to give any place a second chance and when I went back with a group of people, my one visit since my bad experience, the food was better. 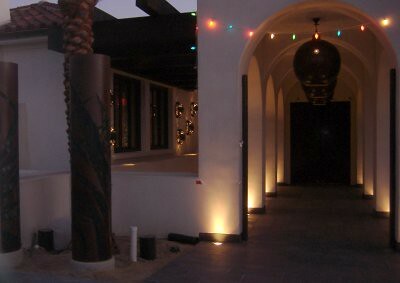 Comments left by other people there clarify that the Westminster location is still definitely the better of the two, with no dissenting or contrary opinions. It goes against the credo of my blog (which is to have an overall positive tone) to tell people to not go to a certain restaurant but hopefully the FV Alerto's can put a little effort into catching up with the Westminster location. I know I recently posted a review of Lucia's by "ChubbyPanda" but I went about two weeks ago to finally try it myself and took some pictures that seemed different enough from his to be worthwhile posting. The three things I was struck with when eating here was how authentic it was, how much food you can get for very little money, and how psychedelic the clock on their wall is (it's not something a photo could convey). 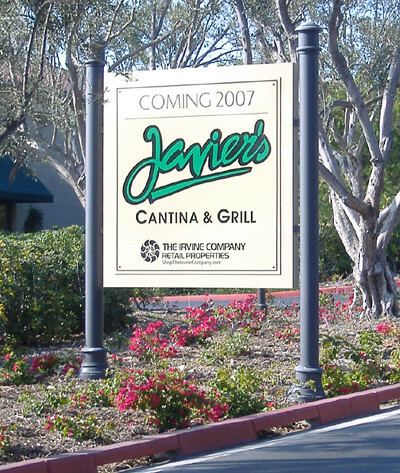 CLICK HERE to read ALL our extensive Javier's Cantina coverage including information on their old location, their location that has just opened, their location that is about to open, and their location at a Mexican resort (includes a couple dozen photos). 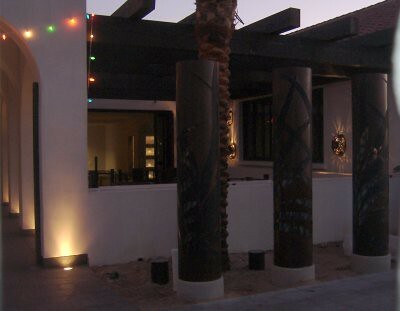 Found out today that the expected opening of the new Javier's at the Crystal Cove Promenade will be around November 25 or 26, although an exact date has not been nailed down yet. 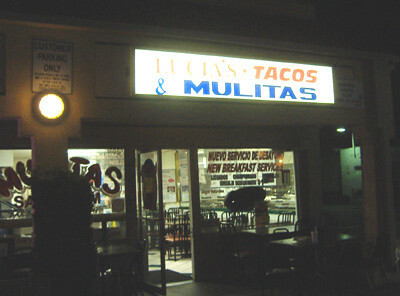 Also found out that when it opens that their original location in Laguna Beach will close down . . . but maybe not right away. 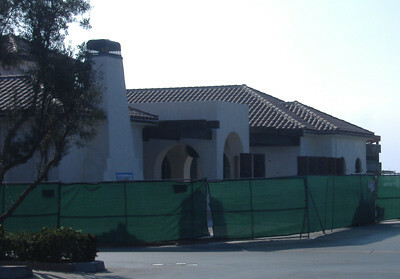 It looks like it is coming along but maybe not quite ready to open on the 25th or 26th. Then again maybe it will open then. Stay tuned for more information . 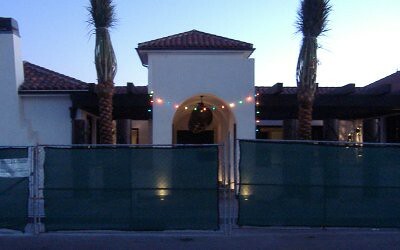 . .
Somebody at the construction site told me it would open on Feb. 9. 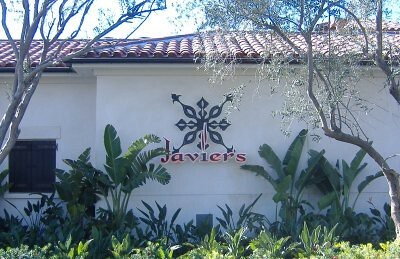 IMPORTANT UPDATE (PLEASE READ): This new Javier's location is open now and we have a big review of it. 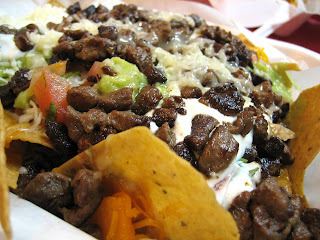 CLICK HERE to read the review and to see all the photos. 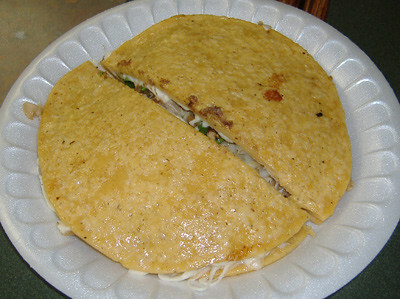 (READ HERE FIRST: This blog has covered all three Mexican restaurants at Disneyland and other spots in the resort where you can get Mexican food. 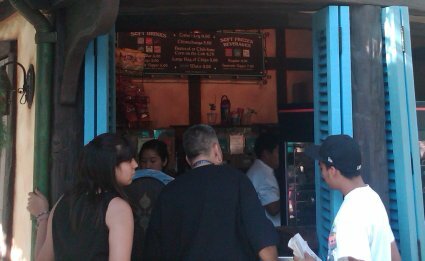 If you are searching for such information WE HAVE IT but this one entry about the chimichanga carts is only one part of it. If you want to read all our coverage then click here or on the image of Panchito the Rooster immediately below. 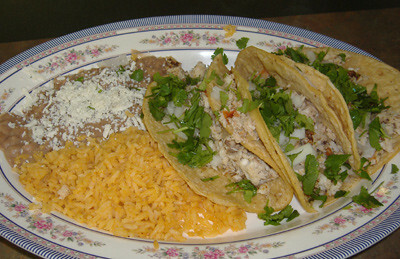 If you want to read about all the Mexican food at the Disneyland resort that link will take you to it. 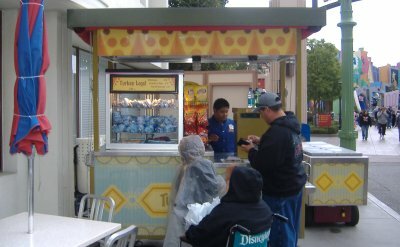 You might've thought I've covered all the Mexican food there is to cover at Disneyland Resort but I still haven't covered their chimichanga carts. 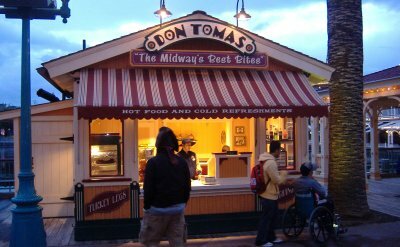 I know of one at DCA and one at Disneyland proper. There could be more. 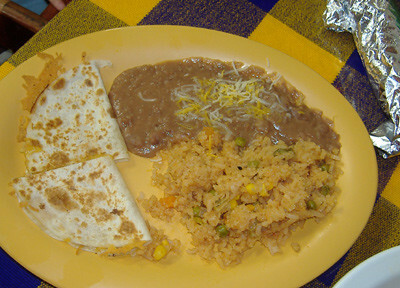 Chimichangas are basically deep-fried burritos, flour tortillas wrapped around refried beans. When I was there earlier tonight I noticed that the cart in Frontierland was also selling beef tamales as a holiday thing. As far as I can tell no salsa is provided. If you know any differently please leave a comment. 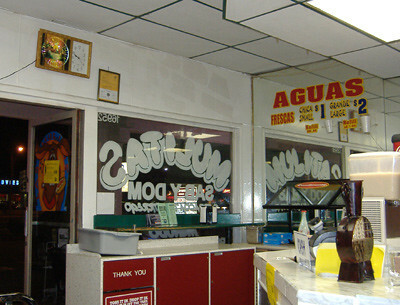 While the wildfires of last month were raging the OC Register's Fast Food Maven Nancy Luna e-mailed me and asked, "What's the name of that place you reviewed out in Modjeska Canyon?" I gave her the name of Rose Canyon Cantina and Grill and she looked up their number and called them to see if they were safe from the fire. Co-owner Melanie Cox answered that they were alright even though they were somewhat close to the flames. This got me to thinking that I wanted to get the word out that this nice restaurant in one of my favorite settings suffered no fire damage and they are still open for business, though I couldn't fault anyone for thinking that the location could've been burned up. So I made my second trip out there, one year after my first trip. 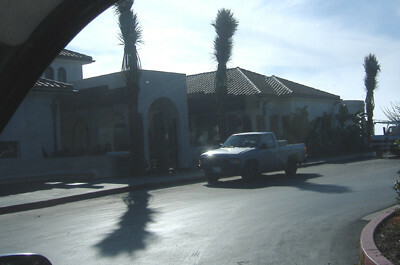 I did see some fire damage on the way but Rose Canyon Cantina and Grill is unharmed and ready to serve up some great Mexican food. Another impetus for me going there again was that I had checked their website recently and saw that it mentioned that they had a few new menu items. That's usually a good reason for me to go back to a restaurant. My waiter pointed out what the new items were and one of the new items is called the "OC Fire Station 18 50/50 Soup" which, according to their menu, is, "A combination of our albondigas and tortilla soups and a favorite with the Crew from Fire Station 18." Very fitting to be eating the fire station crew's favorite soup so soon after the fire. Hey, if I can't be a heroic fireman I can at least eat like one. Some of the other new items were shrimp enchiladas and spinach enchiladas, or you can combine them and get shrimp and spinach enchiladas. 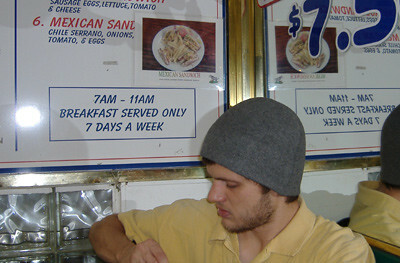 In sticking with the 50/50 theme I went for the shrimp and spinach enchiladas: "2 corn tortillas filled and rolled with spinach and shrimp, then covered with our salsa blanco especial and topped with melted jack cheese:"
The following picture is of the sign you don't want to see if you are trying to get there, but at least it gives you the phone number to call if you really get lost. If you use the Yahoo! Map feature above you can input the address of your starting destination and you'll get very accurate directions to Rose Canyon Cantina and Grill, as I did. 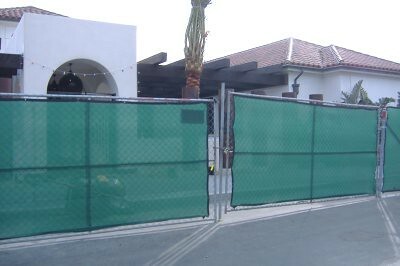 They are simpler than you might think but once you arrive you'll feel comfortably removed from the hustle and bustle of typical Orange County life.